Turn Up The Turmeric (Smoothie) and get glowing! I’m all about turmeric and all it’s benefits even more so in the last year as I’ve been finding more and more ways to get it in to help with post workout recovery and inflammation in general. Not to mention it’s great for the immune system and helps fight oxidative stress in the body. This has been key in the past weeks being sick and flying to sunny California. This recipe was suppose to be posted just over a week ago when I flew out to California but since I was sick that week I had a little mishap in scheduling it and didn’t realize until I got back to the hotel after spending a couple hours at Expo, the only hours I got to spend there as I pushed it a little too hard. I’m not going to lie I’m still a little upset things didn’t go as planned and I missed out on a lot I had planned but I realized a couple days later while trying to recover and enjoy our anniversary, 15 years, trip to Napa. It was a week ago today that I woke up in Napa just starting to feel better and thinking we would be able to still get in most things we had planned that week. I got a call from my mother to tell me that my grandmother had passed. This came as a shock and crushed me. My grandmother and I were very close, the girls and I visited her weekly, and I’ve mentioned her in many posts as such a big part of my life. She was great the last time we saw here, a coffee date just a week before and we painted her nails the green she had requested for St. Patrick’s Day. We always do a big St. Patrick’s Day dinner with her but were going to miss it again this year and were planning on bringing something special yesterday. She came down with pneumonia the day after I got to California and she couldn’t fight it. I fought the urge to fly back home, my parents and everyone told me to stay. The week wasn’t the same but it really made me enjoy each moment and notice and appreciate things I might not have. We still made the most of our week and my birthday out there. Since flying back late Friday night we’ve been with family and soaking up all the snuggles and hugs of my girls. Yesterday we kept our planned coffee date with my grandmother only it was an empty coffee cup with her name at her visitation. Today we will say our final goodbyes. My point of sharing is that it is life and it doesn’t always go as planned. Again I’m reminded to cherish every moment to it’s fullest. I was upset I wasn’t going to have time to post the recipe I intended today and was going to apologize and tell you it would come later this week. Just as I haven’t been keeping up with social media, and thank you again to all that have sent thoughtful messages I’m trying to keep up with responses. It’s life and things happen, we do what we can, roll with the flow, and make the best of what we can. Honestly I’m surprised I’m taking the time to update this recipe from the original that was schedule to post and didn’t but I need normalcy as well with everything going on. I just wanted to be open with those who may not have known what happened as I know many still thought I was really sick and tell you I thank you for your patience as I try to keep up with comments, replies, posts, and life. It’s very hard as I’m a happy person and really like to keep things positive and upbeat. Now back to the post and recipe…. 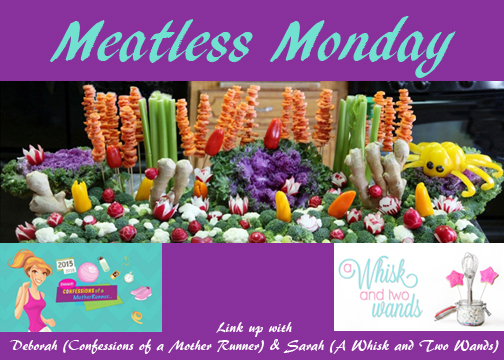 and our weekly Meatless Monday link up. Thank you for joining Deborah and me for another great link-up. Adding turmeric into my post workout smoothie and smoothie bowls is a regular occurrence (maybe not this week as my body still might not be ready to jump back into things and I’m trying to listen to it) but there are rest days when I don’t have a big post workout smoothie/smoothie bowl. There are also days, like the day I discovered this combo, that I’m more in the mood for a juice or lighter smoothie. More of a thicker juice but smoothies come in so many different forms and there are even juices so thick I would consider more of a smoothie. I’ve made this Turn Up The Turmeric Smoothie a couple different ways and I’ll share my 2 favorites! First a simple blend of Golden Turmeric Milk, an orange, a carrot, and a pinch of cinnamon! You can also add in a little extra ginger if you’d like but I tend to add a extra when making my homemade Golden Turmeric Milk. 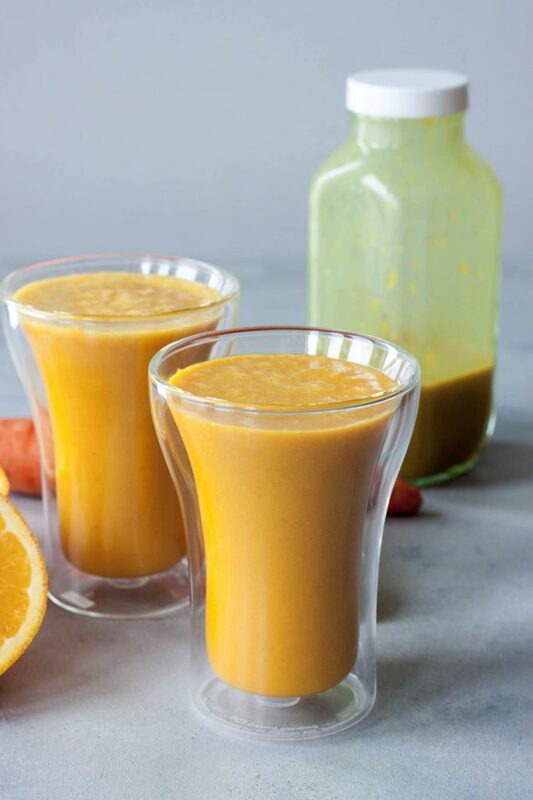 Golden Turmeric Milk is easy to make, only taking minutes and makes a double serving so you can make it and have enough in the refrigerator for 2 days of smoothies or smoothies bowls or even drink a warm cup before bed and save the rest to whip this Turn Up The Turmeric Smoothie in the morning. With the orange juice, carrots, and just this combo is great in the morning! You can also buy bottled turmeric milk if you’d like. If you have orange juice on hand or like to juice you can use orange juice and some carrot juice for a lighter juice texture. We don’t usually have orange juice on hand and more often have oranges so I like to use those. The second way I like to enjoy this Turn Up The Turmeric Smoothie, and this is one I love in the afternoon (not that you need to enjoy these at a certain time of the day) is using half the amount of Golden Turmeric Milk and adding in kombucha! Ginger kombucha is my favorite in this combo and a great way to get in some probiotics! Bonus for more nutrients and good for you and your gut probiotics. Turn Up The Turmeric Smoothie, two ways, yes! Like I said if you make a batch of homemade Golden Turmeric Milk it makes 2 servings which means you can make both versions and enjoy a little warm before bed. If you still haven’t tried Golden Turmeric Milk or are looking to add more turmeric into your diet you are sure to love if not all 3 ways at least 1, today is your lucky day! 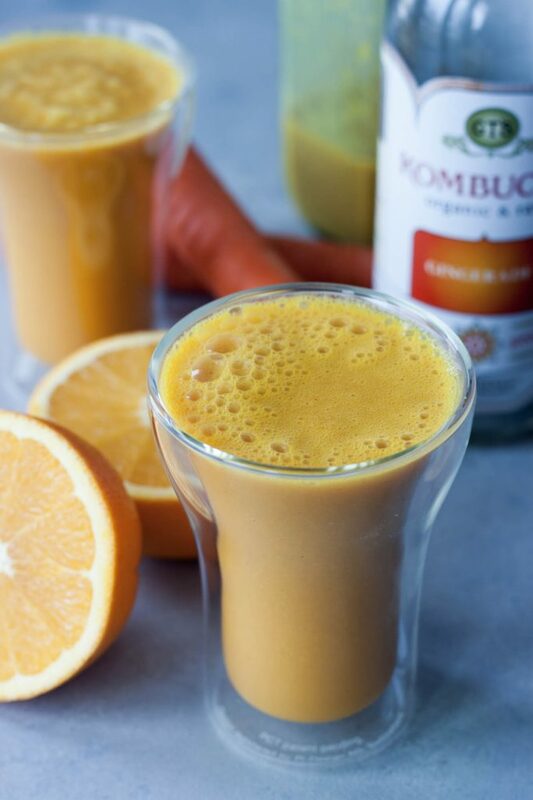 *Optional 1/2c turmeric milk 1/2c kombucha (Ginger Kombucha is my favorite in this smoothie). Start by making the Golden Turmeric Milk below, if making, ahead of time. Cut your peeled orange and half and pull out the large seeds. In a Vitamix, or high-speed blender, blend together turmeric milk, orange, carrot, and a pinch of cinnamon. If making the kombucha version you can blend it in, or I like to pour it over top of the smoothie in a glass and gently just give it a stir. Enjoy! You will need to make the Golden Turmeric Milk ahead of time. In a saucepan over medium heat bring milk, turmeric, ginger, cinnamon, and pepper to a boil whisking occasionally. Reduce to simmer for 5 minutes. Place in a glass jar or bottle the refrigerator to chill. This recipe will make 2 servings so you can enjoy 1 serving warm now or chill all of it to enjoy later cold, blend into smoothie bowls, or make 2 Turn Up The Turmeric Smoothies. I don’t keep Golden Turmeric Milk for more than 2-3 days in the refrigerator. Like it? PIN it for later (2 options)! 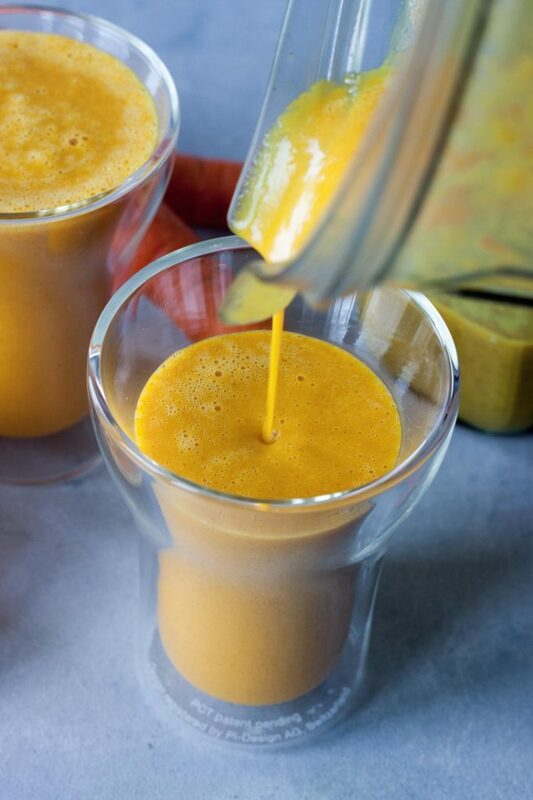 Turn Up The Turmeric Smoothie and get glowing! Delicious superfood turmeric golden milk based smoothie with kombucha option for a probiotic boost! Spreading the Meatless Monday love I’m also linking up with The Fit Foodie Mama and Food Pleasure and Health! I’m always looking for ways to get more turmeric in my diet, so this is perfect! I know the feeling, can’t get enough. Thank you for joining us! Thank you Deborah. It’s been really hard and she was so loved and will be missed. I’m ready to get to a little normalcy after these last couple weeks but I know my heart will still be heavy as I don’t think it’s really sunk it fully yet. What a glass of sunshine! Such a great way to start the day off right! Thank you, sometimes you just have to make your own sunshine. 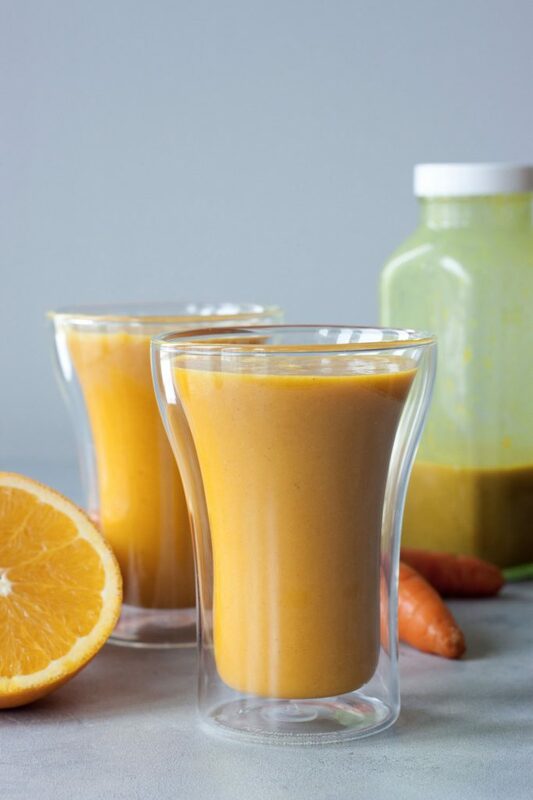 I am sorry for your loss- and feeling terrible on top of it all~ This turmeric smoothie is a great immune booster- a little self care sounds like a good thing right now! Thank you, yes it probably is and I’m trying to focus on that after being sick, traveling, and now this. The last couple weeks have been far from normal. 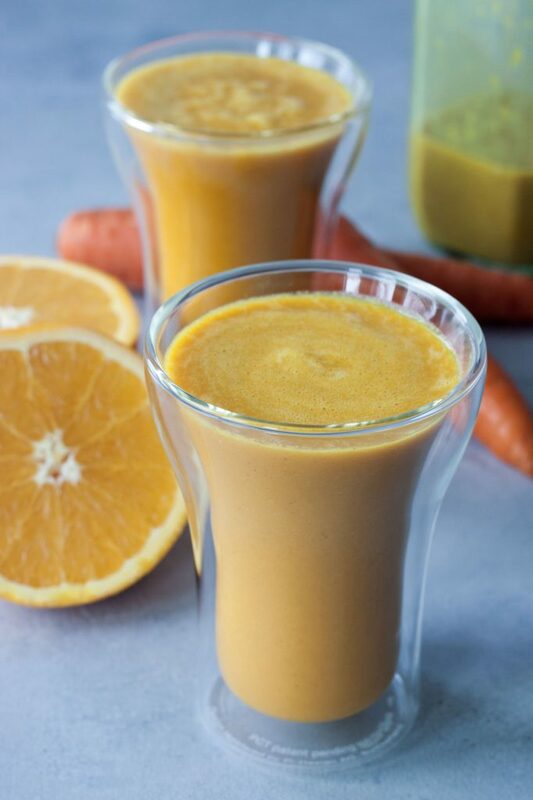 This is turmeric smoothie perfection! Orange and carrot both go so well with this spice – fabulous recipe idea Sarah. Thank you Alisa, it’s a pretty great combo. I’m so sorry to hear about your Grandma. Big hugs to you and your family. This smoothie sounds delicious! I have been totally obsessed with turmeric lately, too, and have been putting it in everything. Love all the nutritional benefits…plus its makes everything so pretty golden yellow! Yes I feel you on the obsession! So good for you and the bonus sunshiny color helps put a smile on your face when you sip it. I’m seeing so many delicious turmeric recipes lately and so little time to try them all! I might just have to have a turmeric tasting night! Any excuse for a party, right? 😉 This one looks great! Any way to get turmeric in a diet is a great and this one looks absolutely tasty! A turmeric tasting party sounds amazing, count me in! You know I love turmeric in smoothies! This looks delish! Oh I know, and I know you’d love this one! So very sorry about the loss of your grandmother! This smoothie looks so refreshing! It’s the perfect way to start the day for sure! It’s a great way to start the day, sipping it while the sun comes up. You know me and turmeric! Definitely trying both versions of this. Forget tans, if we are what we eat we’ll be yellow by summer. Haha! You’ll have to let me know what you think. Oh I am so sorry to hear about your grandmother. It is so hard losing a loved one, a close family member and friend. I am thinking of you and your family and wish you healing thoughts during your sadness. Your smoothie sounds delicious. The orange and carrot would go well with the ginger & turmeric.